Marymount Manhattan College - Please join us! 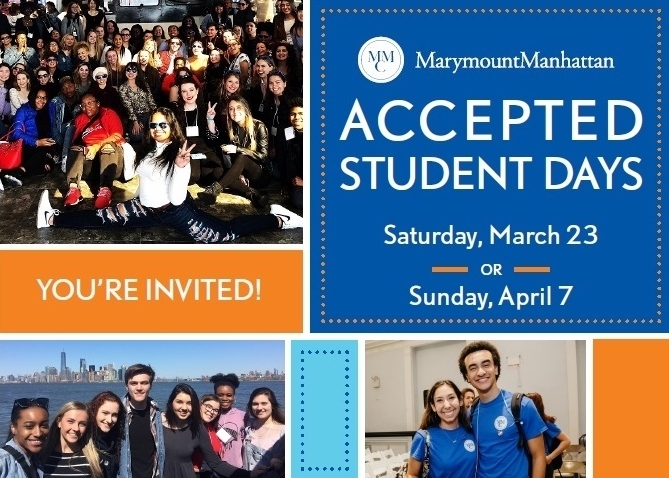 Congratulations on your admission to Marymount Manhattan College! Please select the date that is most convenient for you from the options listed at the bottom of the page. Accepted Student Day offers the opportunity to explore all that MMC has to offer before the official start of classes. Get ready for an exciting program full of informative and fun activities for you and your guests. The program runs from 10:00 am to 5:00 pm. Enjoy a boat cruise around New York Harbor! Take in skyline views while enjoying lunch, learning about college life from our student leaders, and dancing to a live DJ. Please Note: only accepted students will be permitted on the boat. Parents and guests will have planned activities on campus. Meet with a Financial Aid staff member to review your student's financial aid award and discuss payment options. This event is exclusive to our Accepted Students for Fall 2019.